Join Sam, a boy of thirteen years old, and his friend Princess Aurora as they embark on an amazing adventure in the Kingdom of Aurelia. Just as this incredible world entered into an epoch of the Renaissance and technological development, a plot directed against the royal family is discovered. It's up to you to find the villain who poisoned the princess so you can rescue her. Use advanced technologies to help you on your quest, including a helpful little robot named Tim and a unique device which can read the thoughts of any character! 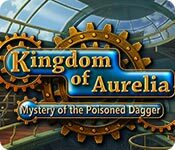 Kingdom of Aurelia: Mystery of the Poisoned Dagger is rated 4.2 out of 5 by 42. Rated 5 out of 5 by Billymama1 from WOW...what a GEM! This is a late review because I just now got around to playing this gem of a game and all I can say is this is one of those rare games where it could have just continued forever and I would have never gotten bored. The graphics are terrific and the game is just one continuous fun thing to do after another. Other games will pale compared to this one...sigh! Rated 5 out of 5 by Talisbird from Steampunk extravaganza The only thing that disappointed me about this game was coming to the end. I wanted more! 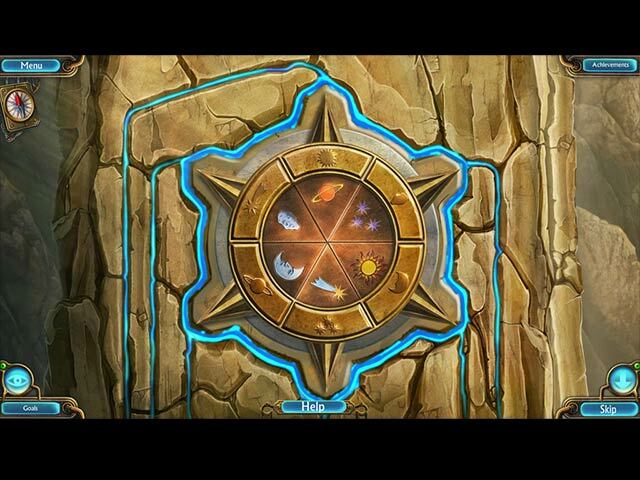 Wonderful and imaginative graphics and interesting puzzles. I had to think hard in parts about what to do next and that was a puzzle in itself, but things were fairly logical within the context of the game. I would like to see more from this developer. Rated 5 out of 5 by skullfun from ~~~~~BEST SE ADVENTURE GAME OF 2016~~~~~ I just completed this amazing adventure from Shaman games. 13 years ago, the Kingdom of Aurelia was attacked and the Royal family was imprisoned - only the Princess managed to escape from the grasps of the tyrants. Play the role of Sam on an epic adventure to save his cousin, princess Aurora and protect the Kingdom of Aurelia. Firstly, notice that Kingdom of Aurelia: Mystery of the Poisoned Dagger is being offered as a Standard Edition - which is a shame considering the quality of this game is actually so much higher than many of the recent Collector's Edition releases. Kingdom of Aurelia excels in the creativity department, giving us a refreshing theme with an innovative gameplay. The theme of Kingdom of Aurelia can simply be described as the Renaissance meets Steampunk, which is something that we don't see often in the HOPA world. As you explore the beautifully crafted landscapes, you will get to meet a variety of interesting characters and perform a range of unconventional tasks. The amount of thoughts and creativity that the developer put into developing this game is insane - definitely one of the most fascinating HOPA games I have played in a while. Further, Kingdom of Aurelia is also quite a challenging game. Maybe it was because many of the tasks given in the game were not something we see often, but at times they took us a while to figure out what to do. Besides, the hidden objects and puzzles were also professionally done and extremely entertaining. Such a tech-focused game would not be complete without a special device or two. Kingdom of Aurelia introduces Tim the flying robot, a robotic companion that can help you pick up items or complete tasks in unreachable places. In addition, you are also given the Mind-scope, a high-tech device that you can use to read anybody's minds. Kingdom of Aurelia: Mystery of the Poisoned Dagger proves that there is still a place for innovation in the HOPA world. There's no reason not to get yourself a copy, especially with a Standard Edition's price tag or the use of one of your free coupons! Rated 5 out of 5 by norm0908 from Wonderful game! How wonderful it was to play such an imaginative, well executed game. This game illustrates how it is not necessary for a really good game to be dark or violent or have the oh so over done swirling smoke . A bit challenging at times, but patience will win out. I loved the graphics and the inventiveness of the scenes. A real pleasure to play and was sorry to see it come to an end. I am hopefully looking forward to seeing more along this line. Rated 5 out of 5 by Italia47 from Captain Hermengilda? I'll just refer to the captain as HG! Hands down this game is about the best I've played all year! Shaman Games, a high five to you! Man, is this game good or what! I love EVERYTHING about this game. Puts me in mind of the Clockwork series I've played that I still have actually and will go back to it one of these days. But this game is even more sophisticated. The strategy is phenomenal and this is only a standard edition I'm playing. I expected this to be kind of elementary and silly--not at all. The game-play, the flow, the storyline, the ingenuity of this game well deserves a 5-star rating. 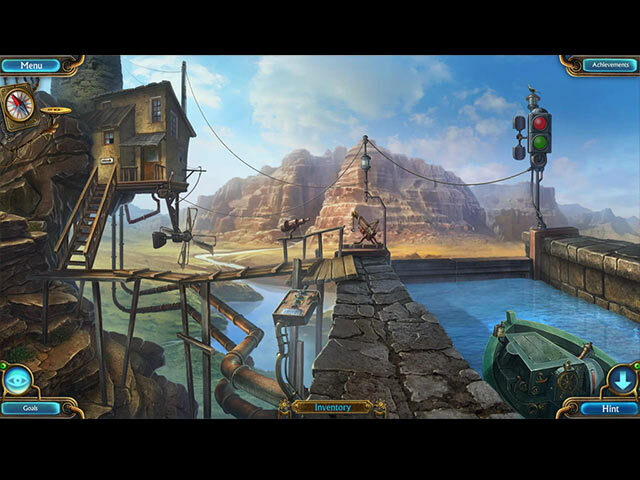 Love the unusual mini-games and very interactive hidden object scenes. They're not difficult but very clever and tedious.The music is wonderful; the storyline, thus far, is intriguing. The developers have cleverly covered just about every aspect in this awesome game. I'm only half-way through it and actually prefer giving my reviews upon a completed game but I couldn't wait! The graphics are outstanding! In my opinion, Kingdom of Aurelia: Mystery of the Poisoned Dagger is one of the most intelligent games I've played thus far. Great job, devs! You put a lot of thought in the reading materials and though I haven't found a typo yet, the script reads well. I often do take the time in reading the text because it often turns out to be more helpful than not. This is no skimpy production, folks. The devs have thought of everything! I'm going to look in to more games from this developer. The scoop is that dangerous artifacts have been stolen from the Royal Treasury, one of which is the Transformation Amulet and the other is the Cursed Dagger. There is a ritual involved with the Cursed Dagger and this so-called dagger allows the owner to take complete control over its victims. The Amulet of Transformation allows its owner to change his/her shape. There are smugglers involved and the leader is Captain Hermengilda. Some name, huh? As of yet, there has been no evidence of their involvement in this theft. We shall see, though! I could go on and on, but I won't. I highly recommend this game or at least try out the demo. Very though-provoking and fun game. Rated 5 out of 5 by patricia356 from Wonderful "Sleeper" game This game was so charming and enjoyable. Although there was a "bad guy" he did not even turn up until the end. Thought the graphics were very interesting and well done and there were some rather odd fantasy characters. VO's well done. The main complaint was that some of the figures were not as well drawn as they could have been. It was about average in overall difficulty with some things a little too easy and some rather difficult. A perfect game for just relaxing play. I also think it would be an appropriate family game to play with a younger child since the imagery is rather benign. I have given it a 5 because I really did enjoy it and played the demo to the end without realizing it. Always tells me the game is a buy. Rated 5 out of 5 by scamp69 from Excellent game for beginners or old intermediates. Loved the game. There were NO collectibles and NO morphing objects; just a decent fantasy story. The MAP button is in the upper left corner and is not always accurate as to where to go but transports well. I suggest you give it a try. Also see my favorite game which resides on my desktop. I play it daily when I just have a short time to play. Rated 5 out of 5 by charlene_lane from SAVE PRINCESS AURORA REVIEW OF COMPLETED GAME I really enjoyed this game. I believe it was a CE originally, so at the end of the game, there is no bonus, even though they say to play it. There is: * Voiceovers (with dialogue); * Casual, Advanced, Expert and Custom modes of play; * 10 Achievements; * Interactive map; * Tim the robot to help you get items out of reach; * Use of the mindscope to read minds. The graphics are great - scenes are well defined and items you need are easy to see. The story line is easy to follow and I liked the characters. Sound is good and the music is orchestral and really lovely - I had it turned up very loud. 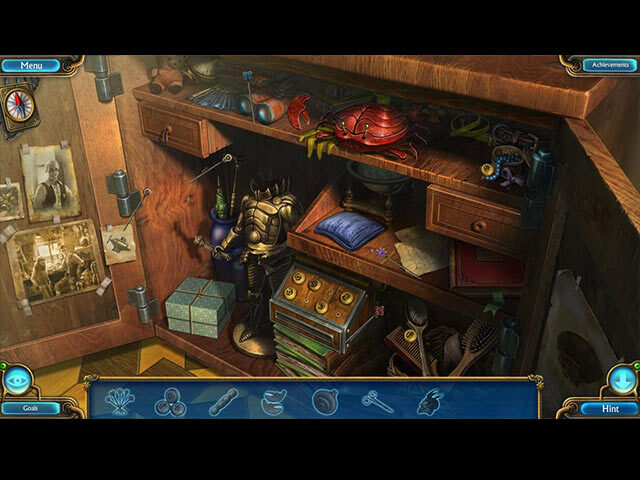 The hidden object games are interactive silhouette where you find one item to use to find another etc. These are not hard to do and I enjoyed them all. You can also play Mahjong if you fancy a change or can't quite find that last item. There are a huge variety of mini-games to play. Most of them are pretty easy to do and it doesn't take long to move on with the game. A couple of them took me a little while to get in the right order - but nothing frustrating or maddening. I found I didn't need to use the interactive map because you don't venture off too far and its easy to remember where tasks are to do. The game took me about 5 hours or so to play on Expert mode with everything turned off - I love this feature. However, you can change your difficulty at any time. Overall, a fantastic game. You will be making potions and a fixing a lot of machinery, so be prepared to get hands dirty! Its not a hard game to play and is perfect for playing in between those big games we play. Its also perfect for all members of the family. I really like this developer. A couple of the characters seemed familiar and I remember playing 'Namariel Legends Iron Lord' a few years back and enjoyed it. Definitely worth having a look at. Happy playing fishies. Rated 5 out of 5 by crochet12 from Kinda steampunky The graphics are very cool. Some nice options that I havent seen before. The is an eye in the bottom left hand corner of the screen. Press it, and it shows you what to examine on the screen you are on.Very helpful! I love steampunk and this has that kind of atmosphere. Rated 5 out of 5 by Gamespaz from One of the best I have played! Great graphics, fun story and just a lot of fun to play. I hope there will be more like it. Help young Sam save Princess Aurora and stop the villain from seizing control of the Kingdom of Aurelia in this puzzle adventure.